What could be better than on a lovely autumn morning than to be invited to London to view some of the landmarks of our Great nation? However this invitation came with a condition, not an open top bus so I could eat doughnuts and drink coffee, the invitation was for the 10th Royal Parks Half Marathon, starting point Hyde Park at 9:00am. 5:45am was the earliest I have woken for an event, 45mins later and out the door full of granola and coffee. First stop Ruislip to park, originally Richmond but checked to find out no tube this weekend (good preplanning). 7:30am Sunday morning tube is quiet, there is a sprinkling of runners highly visible with assortments of bright trainers (is football coping this trend or was it original?) and their name labels proudly being displayed upon their chests. We arrived at Lancaster Gate (London so many options) at 8:00am. A peaceful stroll through the park lead to the festival area which was billed as the Food & Fitness Festival, this is where the masses of people including the 16,000 runners gathered. Being allocated a place near the start meant I missed the Alton Towers style zig-zagging around barriers. The starter was broadcaster Ben Fogle. First mile was great, running smoothly as we went out of Hyde Park, 1st mile clocked in 5:55 (PB) the first half of the course took as outside the parks past Buckingham Palace (didn’t see Her Majesty unfortunately although the flag was raised signifying she was in). The roads were clean and devoid of transport, like post Uber? 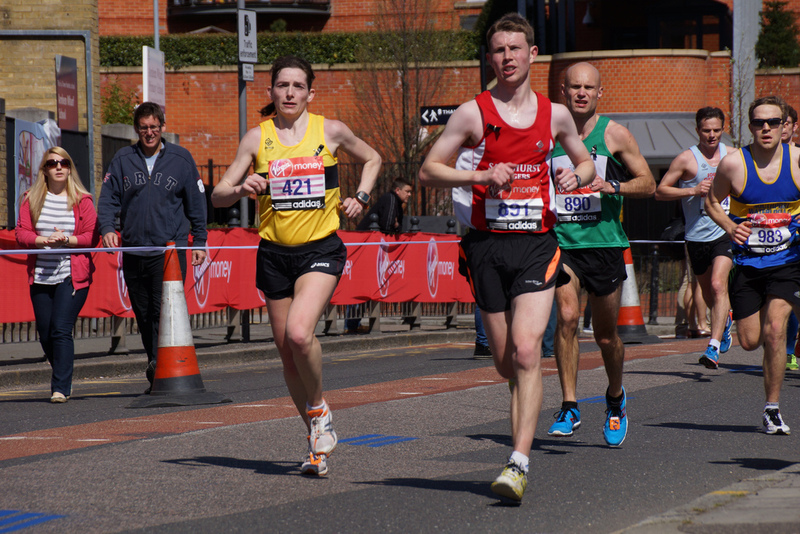 Past Charing Cross at 5km timed at 19:20 PB, the winner (1:08) was already a mile in front! The race is deemed as green and with this in mind I tried not to throw my empty gels onto the floor, I landed one in a bin (a first); felt I deserved a time reduction bonus for that. By mile 6 after going pass Trafalgar Square and Madge again, it was back to the park, where the crowds had started to gather, big in numbers and noise, pass my girlfriend for the photo shoot, she braved the early hour to get here (thank you x). The sun was shining bright, glad it was only a half marathon or would have been too hot. The parks are amazing; it’s a fantastic route, and a brilliant event. I finished 1:28:24 (position 270/16455, category position 30/1996). No pulled hamstrings (loads of physio before). The medal was made out of wood (very green). There was a ‘goodies’ tent where you received random products including Shampoo, slim vitality drinks, teeth cleaning powder, ‘green’ cola and of course ‘randoms’ wow indeed, until I lifted my bag which I had to carry around London. There was a warm down area which was yoga, first time for everything conclusion – my body is inflexible I may need Yoga. Then time to walk into the autumn sunshine… thinking next week I have to run a full marathon in Birmingham!